Just to provide a level of confusion, the newer sensor seems to have almost regained its mojo, after spending a day away with the fairies. The same can’t be said for my blood glucose. After a glass of wine last night, the Levemir seems to be being a little more effective…. Still, the older sensor spent most of the night reading <2.2 mmol/l, the newer sensor seems to have thought that I was around 3.1 mmol/l and my blood sugar was somewhere in between. I said almost regained its mojo…. Now we know that the advice from Abbott is that when the blood sugar is moving fast, don’t rely on the Libre and use blood tests. That all appears fair enough. But what about when the blood sugar isn’t moving fast? 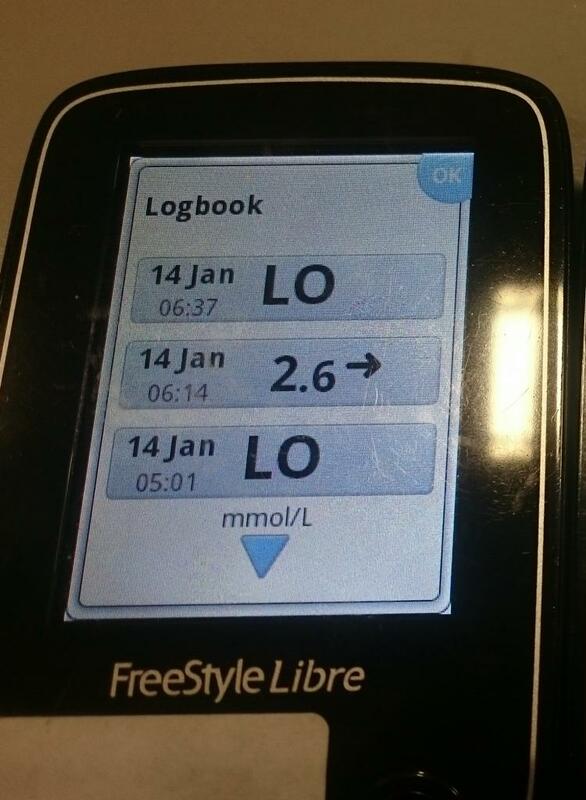 Seems to me that the libre and the blood tests should show similar levels? Take a look at this. The other sensor/reader thinks the blood sugar level is below 2.2 mmol/l as it can’t work it out anymore! So there is clearly a mismatch between the two sensors and the blood glucose level during this period. A basal induced low, which could by no means be described as fast onset. I know that this isn’t great, but I also know why it happened, so that’s not the issue here. 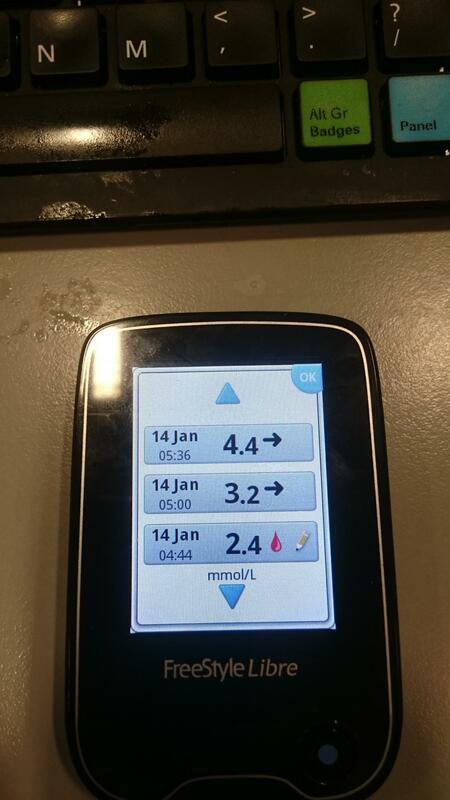 The issue is the variance of the sensors against the blood glucose level once again. 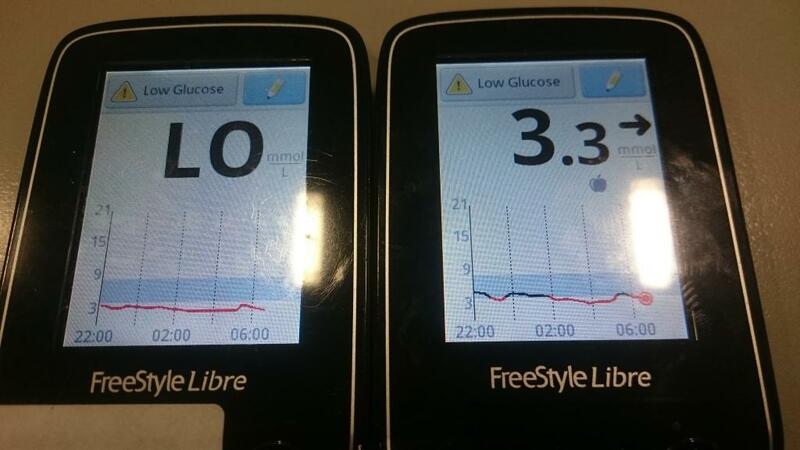 If two sensors can report this differently at low levels, and remember that the newer one is reporting 33% above the actual level, someone with reduced hypo awareness could find themselves in a place they don’t want to be, i.e. on the floor fitting, when they thought they had a good reading and were seeing a flat, slowly changing arrow. This looks as though either sensor accuracy or education about use of the device probably needs to be improved for use outside of normal levels. It also raises a question for me about calibration. Should the factory calibrated sensors be set to report too low so that true hypos (blood glucose falling below 3.5 mmol/l) are less likely, or should they be set higher to enable a better Hba1C result? Whichever it is (and I think from a product safety perspective, the likelihood would be to err on the low side), it needs to be consistent across sensors. It can't measure below 1.1 m/mol. Also, I think that the one more accurate is the one saying 3.3 and the one inaccurate is the Libre saying LO. I think you're missing the point. I know it doesn't measure that low on the sensor (2.2 is the low limit), but the blood was showing in the twos, the scanner in the threes, which is a fairly large margin for error. Even with a +/- 15% variance, the blood would be up to 2.76 while the scanner could be down to 2.81. The two readers were reading different sensors and the one showing LO was likely to be closer than the one showing 3.3. It was the inconsistency across the two that I was concerned about.